I haven't written anything here for a while. Two months, to be precise. I like to write mainly about stuff I cook, new things I've tried out in the kitchen, and occasionally about an experience eating out somewhere. The hubby was away and there was not much cooking or eating out happening so things have been quiet on the blogging front. Well, the man is back and I am back too. One of the first things I wanted to do was make bread again. I grabbed the first free day I had and got out the yeast, the flour, the rolling pin and the assorted paraphernalia and proceeded to get elbow deep in homemade bread. I made Petit Pains au Lait, the WeKneadToBake #17 recipe which was the chosen bread for May 2014. Here's Aparna's recipe. A very easy bread to make and quite perfect for a beginner level bread baker like me, Petit Pains au Lait are simple small sized milk breads that are great on their own or can be enjoyed with a dollop of butter or a dab of jam. 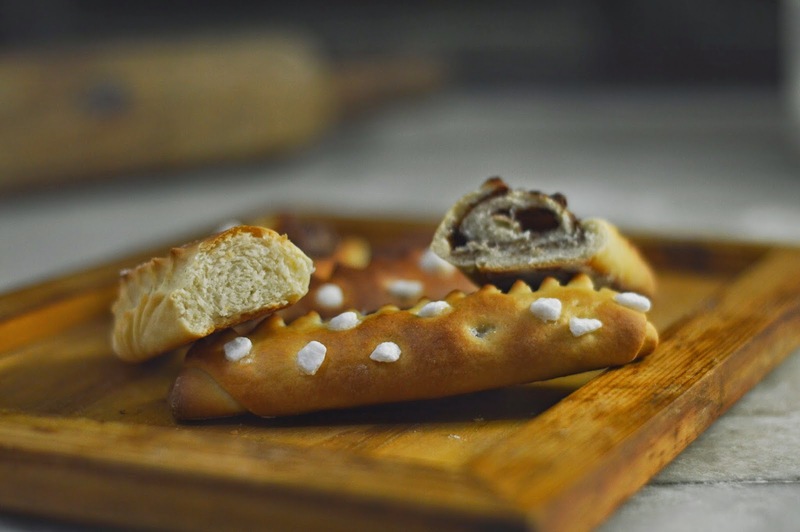 Since the dough is rolled up to shape each mini loaf you can also flavour these with a sprinkling of cinnamon sugar, Nutella, sweetened peanut butter, or jam. Make a savoury version with herbs and cheese if you like or stuff the roll with finely diced ham or soft fried bacon. These will be great to put in your kid's tiffin box too. 2 1/2 cups flour with 2 tablespoons flour reduced. In a large mixing bowl pour in the warmed milk and add the yeast and the sugar. Give it a good stir. Now add the flour and then the salt. Mix it all well with your fingers till it resembles large crumbs. This should take two to three minutes. Now add the butter and knead it into the flour mix to till it all comes together. Remove the dough to your cleaned work surface and start working the dough. Keep a little milk handy and add it by the mere teaspoonful if the dough is too stiff. Knead for a good 10 to 15 minutes till the dough is soft and smooth. Place it a bowl and cover with a damp napkin and leave it to rise. This will take around an hour and a half to double in size. Turn out onto the work surface and deflate it gently. Divide into 10 portions and leave to rise for another 15 to 20 minutes. Take each individual ball of dough and roll out into a circle roughly 6 inches across. Roll up the disc to form a cylinder and then place it on your baking tray. If you're adding a flavouring like Nutella spread it on the disc and then form the rolls. Make ten such rolls and leave them to prove for another hour till they are nice and plump again. A distinct feature of Pains au Lait are the cuts made along one side of the roll that result in a pretty pattern on the golden rolls when they are finally baked. You can see how these cuts are made in this video here. Remember to brush the rolls with a little milk before you make the cuts so the final product has a beautiful glaze. Dot the rolls with pearl sugar if you have it or sprinkle regular sugar. You can also use demerara sugar if you like or avoid the sugar entirely. Bake the rolls in a 200C preheated oven for approximately 12 to 15 minutes. Keep an eye on them as they can burn easily. I burned one batch because I was distracted for just a couple of minutes! These rolls are best had hot out of the oven - they are soft and wonderful and I liked them best with a pat of butter melting into the warm bread.